Here are three posts — and some comments that I received — over on my Facebook account about bed-sharing. 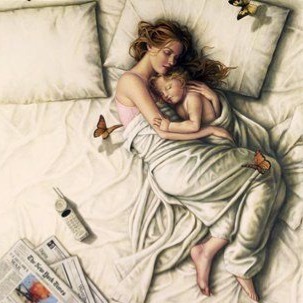 Before I became a mother I always said that I wouldn’t allow my children to sleep in my bed. — PART 1 — You read all of these terrifying things about co-sleeping, and yet there is something so instinctual about it. I remember just after she was born, when my mother and grandmother were here with me, if I fell asleep in bed and the baby was in the other room I would suddenly clutch the blankets in my arms and subconsciously search for the baby as I was transitioning from asleep to awake. Before I became a mother I always said that I wouldn’t allow my children to sleep in my bed. — PART 2 — The biggest reason I felt the way I did about co-sleeping is because I am generally a very heavy sleeper (I’ve always been the person who can sleep anywhere/anytime/anyplace). I really didn’t think I would trust myself sleeping next to my baby. However, as soon as she was born I realized that I don’t sleep the way I did before. If I went to take a nap in the other room while someone watched the baby I would wake up as soon as she let out any kind of cry. Now, when she stirs, I wake up before she even makes a sound. I open my eyes and if she’s awake I feed her or change her. If she’s sleepy, I watch her a minute until she goes back to sleep and I close my eyes again. Before I became a mother I always said that I wouldn’t allow my children to sleep in my bed. — PART 3 — “Breastsleeping” – It felt like I wasn’t getting more than 2 hours consecutive sleep, until I started nursing while lying down. As soon as I started doing that it was like magic. I didn’t have to actually wake up, sit up or wait for baby to finish/go back to sleep. And I didn’t have to risk falling asleep while holding her in my arms. “Breastsleeping” allowed me to multitask by feeding and relaxing at the same time. I know that this is the main reason why most of the time I feel adequately rested or at least pretty far from exhausted. •D** slept with us for 6 months. I think you are right, it is instinctual. I firmly believe I was not sleep deprived for those 6 months because I was never worried about D** during those nights. If he needed to nurse, he would usually latch on himself. I think it formed a very healthy, happy bond between us. •Almost a year and a half and my bug still sleeps with me- I’m a huge supporter of SAFE co-sleeping. I feel we push our children to be independent FAR too early in their lives. •My babies all coslept! And nursed as they pleased! W****** is 8 months old still co sleeping and nursing! •AAP has warned against this. It is ok to have the child in your room up to 6 months to a year….in their own bed. So many deaths have occurred because of this practice…if your child dies because of it…you will be charged with murder. A final point that I would like to make is that breastsleeping/bed-sharing can be done safely or unsafely. It’s so important to understand and follow guidelines for safe cosleeping. If you are under the influence, overtired or on a surface other than your bed, just don’t do it! It goes along with the old expression “better be safe than sorry”. So, do what you feel is instinctually right for you and your baby, but educate yourself and do things safely.